Olympia Morata, Scholar, Teacher, and an "Italian Heretic"
Olympia Fulvia Morata was the daughter of the Italian humanist Fulvio Pellegrino Morato. A Mantuan, he was exiled from the city by 1517 (for unknown reasons) and made his way to the Este court in Ferrara. There he was appointed to oversee the education of the two youngest sons of the duke, Alfonso I. And there, in Ferrara, he married Lucrezia Gozi. Their eldest daughter, Olympia Fulvia Morata, was born in 1526; her father provided her with an excellent classical education. But in 1532, Morato left Ferrara--again, the reasons aren't clear--and took his family to Vicenza, in the Veneto, where he secured a post as a public master of Latin. He also gave lectures, wrote, and published. During the years of his absence from the Este court, Morato also spent time in nearby Venice and began not only expressing anti-clerical views but also opening his home to young intellectuals for discussions of the work of religious reformers like Erasmus, Luther, Zwingli, and Calvin. All of which drew attention from the Council of Ten in Venice, anxious about the dangerous effect of teachers like Morato on the religious views of their students. Papal legates arrived in Venice in order to investigate, and prosecutions followed. Although Morato was not accused of heresy, he felt himself to be in some danger and, after six years of absence, he returned to Ferrara. Back in Ferrara, Morato was once again appointed to oversee the education of two young sons of the Este court, these the children of the new duke, Ercole II, and his mistress, Laura Dianti. Morato also took up a position teaching rhetoric, oratory and Latin authors at the University of Ferrara. The court to which Morato returned had become a refuge and support for religious dissidents, especially those fleeing from France. The duchess of Ferrara, Renée of France, had grown up under the influence of her aunt, Marguerite of Navarre, a supporter of French Huguenots. Renée had carried her reformist views with her to Ferrara, and she had begun to shelter to religious dissidents, including John Calvin, whom she met in 1536 as he fled persecution in France. She also fostered intellectuals like the poet Vittoria Colonna who also found themselves investigated for their religious views. Soon after her father's return to Ferrara, between 1539 and 1541, Olympia Morata joined the court of the duchess of Ferrara, where she was to be the companion of Renée's daughter, Anna d'Este. There she continued her studies, earning praise as a prodigy of learning. As Jennifer Haraguchi notes in her biographial essay on Morata, the young woman, still in her early teens, "was considered a 'fanciulla prodigio,' and won the praise of many intellectuals for her fluency in Latin and Greek." yarn, shuttle, loom-threads, and work-baskets. and the pleasant choruses of the twin-peaked Parnassus. These are my glory, these my delight. While at the ducal court, Morata shared tutors and texts with the young Anna, but these educational opportunities came to an end in 1546 when Morata returned home to take care of her sick father. After his death in 1548, Olympia Morata attempted to return to court, but she met with obstacles--her father's interest in Protestantism (some sources indicate he converted to Calvinism before his death) and her own religious sympathies may account for some of the problems. 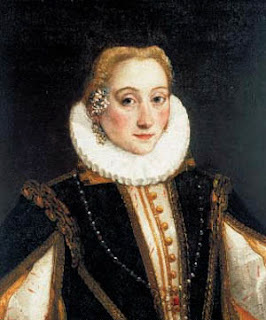 But during Morata's absence, Anna d'Este had been married to a French prince, a member of the Guise family, and had left Ferrara--Morata was no longer needed as a companion. And, finally, increasing pressure on the Calvinist sympathies of the duchess may also have prevented Morata's return. Having lost her father, her friend, and her position at court, Morata remained in her mother's house, and it seems to have been during this period that she herself became a Protestant. She continued her her correspondence with other intellectuals, including one through whom she met a student who had come to study medicine in Ferrara, Andrew Grunthler of Schweinfurt. In 1550 she married Grunthler, and within a few years the two left Ferrara, taking Morata's younger brother with them, at least in part to evade the Inquisition. Grunthler found a position in Schweinfurth, a Protestant town, where he was physician to Spanish troops that had been stationed there. The couple were caught between opposing forces in the city when religious tensions broke out into war--a Protestant town, pillaged by the Spanish soldiers garrisoned there, trying to withstand the emperor's troops that were besieging Schweinfurth. The city suffered famine, bombardment, plague, and fire. They were eventually able to escape to Heidelberg, where Grunthler took up a medical lectureship. Olympia Morata began to tutor Latin and Greek. She did not live long, however. 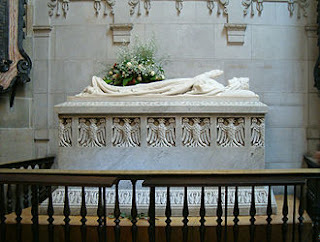 She died on 26 October 1555, just twenty-nine years old. Two months later, her husband and brother were also dead. She is buried, with her husband and brother, in St. Peter's Church, Heidelberg. Much of Morata's work was lost--some during the siege of Schweinfurth and the hasty flight from the city, some when Renée of France's archive at the ducal court was destroyed in 1559 by the Roman Inquisition. But Morata's husband sent Morata's surviving work to Celio Secondo Curione, who had been Fulvio Morato's friend and who had been one of Olympia's most dedicated supporters and a life-long correspondent. An Italian humanist scholar, Curione had fled the Inquisition himself, eventually winding up at the University of Basel. Curione published Olympia Morata's collected work (in editions of 1558, 1562, 1570, and 1580): fifty-two letters (most written in Latin), two dialogues (in Latin), two declamations (in both Greek and Latin), eleven poems (eight in Greek and three in Latin), translations of seven Psalms (in Greek), and the first two stories of Boccaccio's Decameron (in Latin). For Haraguchi's essay, part of the University of Chicago's Italian Women Writers database, click here. An extended account of Morata's life and work, in addition to a complete edition of her texts, is Holt N. Parker's The Complete Writings of an Italian Heretic. Until recently, so little was known about the painter Angélique-Louise Verrier that the few printed references to her, as "Mademoiselle Verrier," were often considered to be misspelled references to a similarly elusive French painter, Marie-Nicole Vestier. Not that Verrier was completely unknown. As Germaine Greer notes in The Obstacle Race, "A Mademoiselle Verrier who exhibited work in 1786 became Madame Maillard, but of her career as a painter we know nothing more." Greer published The Obstacle Race in 1979. Now, some forty years later, a bit more is known--the most accessible source of information about Verrier is found in Neil Jeffares's Dictionary of Pastellists before 1800. According to a description of Verrier's work published in the Mercure de France, a newspaper and cultural journal, the portrait was of a woman wearing a straw hat. The writer describes the "tone of the color" in Verrier's work as "very good" and the drawing as "sensible and correct" ("Le ton de couleur m'en a paru fort bon; le dessin en est sage & correct"). The writer offered one bit of hesitation--the portrait seemed a bit cold--but then suggested that perhaps that was the fault of the model ("peut être est la faut de la modèle") rather than of the artist. In another contemporary review of this 1785 work, its color is described as "fresh and harmonious." Verrier submitted another work to the 1786 Salon de la Jeunesse, though the medium is not identified. It too drew critical attention. The Mercure notes that her talents progress "each year," developing in "a very interesting manner." In this 1786 reference, Verrier is identified as one of Adélaïde Labille-Guiard's students. One other portrait by Verrier is listed by Jeffares, a pastel of Louis-Charles, the younger son of Louis XVI and Marie Antoinette--the portrait is dated to 1789, the same year Louis-Charles became dauphin just after his older brother's death. If the French Revolution had not intervened, he would have become Louis XVII. At some point, Verrier married Louis Maillard--their son, Louis-Auguste-Jean-Baptiste, was baptized on 27 July 1799, when Verrier would have been in her late thirties. Louis Maillard had died by 1801--an inventory after his death, requested by his wife, was made on 16 October of that year. Angélique-Louise Verrier exhibited at the Paris Salon of 1802 although, aside from mentioning this, Jeffares includes no further details. A Google search also fails to turn up any more information. But the digital library of the Bibliothèque nationale de France (which has provided many incredible resources as I've been posting on this blog) makes available all of the livret of the Paris Salons. According to the 1802 catalog, Madame Verrier-Maillard's exhibited work was a full portrait of "Mme. ***" and her son,” who is presenting to her his "verses on peace, which have won a prize" ("à qui son fils présente des vers sur la Paix, qui ont remporté prix"). In the catalog, Verrier is still being identified as a student of "Madame Vincent," Labille-Guillard's married name. Angélique-Louise Verrier-Maillard died in Paris on 29 July 1805. I haven't been able to find any reproductions of her work . 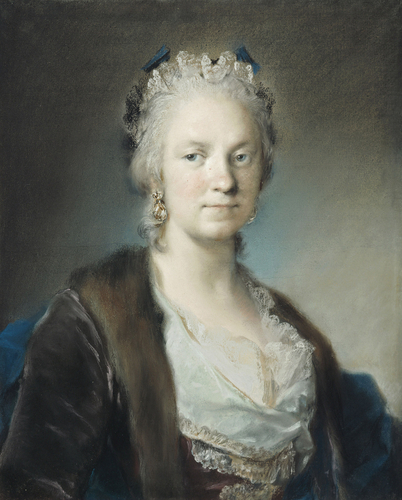 . .
*In her essay on female self-portraits in the eighteenth and nineteenth centuries, Marie-Jo Bonnet says of the Salon de la Jeunesse that it was "réservé aux élèves, qui dure une journée et se tient en plein air le jour de la Fête-Dieu, place Dauphine à Paris." ("reserved for students and which takes place in the open air on Corpus Christi Day at the Place Dauphine, Paris"). **Digitized copies of the Mercure de France are available via Le gazetier universel: Resources numériques sur la presse ancienne, which you can access by clicking here. Born in 1373, Jadwiga was the youngest of three daughters born to Elizabeth of Bosnia and Louis, king of Hungary and Croatia--and, after 1370, of Poland--a member of the extended Anjevin line of the French Capetian dynasty. Without a male heir, Louis made plans for his three daughters, Catherine, Mary, and Jadwiga, to succeed him in Hungary and Poland as well as in Provence and in the kingdom of Naples. * His daughters were not only desirable marital prospects, but their marriages were also a way for Louis himself to consolidate his influence and power. 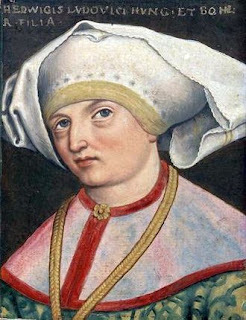 In pursuit of his political ends, Louis arranged for the marriage of his eldest daughter, Catherine, to Louis I, duke of Orléans, and he promised the Holy Roman Emperor that his second daughter, Mary, would be married to Charles IV's second son, Sigismund of Luxembourg, an agreement that was signed by deed in 1373. In 1375, Louis arranged Jadwiga's marriage to the Habsburg William of Austria, and the girl was sent to the court in Vienna, where she lived from 1378 until 1380. After the death of Catherine in 1378, Louis clarified his intentions for Mary and Jadwiga, indicating that Mary was to succeed him in Poland and Jadwiga in Hungary. But after the death of Louis himself in 1382, Elizabeth of Bosnia had Mary crowned "king" of Hungary, with Sigismund of Luxembourg attempting to take control of Poland. In resisting Sigismund (and the Habsburg powers), the Polish nobility ultimately ended the personal union of Hungary and Poland that Louis had forged, electing Jadwiga--then a child of nine--as "king" (rex) of Poland on 15 October 1384. ** She was crowned immediately--probably as a signal that William of Austria was considered an altogether unsuitable match. Instead, Jadwiga was married to Jogaila, grand duke of Lithuania, on 15 February 1386. The marriage was desirable for Poland and not only because it would allow them to resist pressures from Austria--the newly combined territories of Lithuania and Poland were larger than the previous union of Hungary and Poland. But Leopold of Austria did not relinquish his son's marriage to Jadwiga easily. Leopold demanded that the marriage between Jadwiga and his son be consummated, and William of Austria traveled to Krakow, only to be barred entry to Wawel Castle. A confusion of accounts blurs what might--or might not--have happened when Jadwiga and William did finally meet. Did William and Jadwiga consummate their marriage? Contemporary chroniclers provide different answers, and modern historians are also divided, but one fact is clear: William of Austria was ultimately forced out of Poland, and the match with Jogailo was made. There was one still slight problem to be overcome before the marriage could be solemnized--neither Jogailo nor his people were Christian. And so, by the terms of the Union of Krewo, Jogailo converted to Catholicism, was baptized as Władysław Jagiełło, and pledged to promote the conversion of the people of Lithuania. By the way, one more note about traditional marriage: on the day of their marriage, 15 February 1386, Władysław Jagiełło was thirty-five years old, and Jadwiga just twelve. Sigh. Of course, the rejected William refused to give up, his Teutonic knights invading Lithuania, despite having been offered compensation by Władysław Jagiełło. William persisted in claiming that he had consummated his marriage with Jadwiga, the rumors and claims ultimately leading to a papal investigation, forcing Jadwiga to swear that she had never had a sexual relationship with anyone but Władysław Jagiełło. When she wasn't defending her marriage against William, Jadwiga and her husband also had to resist invasion by her sister Mary's husband, now king of Hungary, who hoped to add Poland, or parts of it, to his own territory (he had problems of his own, however, and spent a great deal of time defending Hungary against the threatening Ottomans). 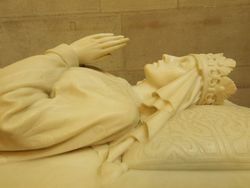 After her sister Mary's death in 1395, Jadwiga became the heir to the crown of Hungary. If she and her husband were to succeed there, they would themselves pose a threat to the German empire--and so, after years of turmoil, a peace was negotiated. Jadwiga's claims to Hungary were recognized, but no further conflict with Sigismund followed, though tensions remained. On 22 June 1399, Jadwiga, queen of Poland, gave birth to a daughter, named Bonifacia. Within a month, both daughter and mother had died. Jadwiga, queen regnant of Poland, was just twenty-five years old. She is buried in Wawel Cathedral. Despite her relatively brief reign, Jadwiga is regarded by historians as one of the most important rulers of Poland--primarily for her marriage, which resulted in the creation of a great state. She is also noted as a patron of religion and scholarship. She founded hospitals and schools, notably a college in Prague. The University of Krakow, which had been founded in 1364, had dissolved; Jadwiga refounded the university, modeling it after the University of Paris. Related to Elizabeth of Hungary, Jadwiga was also noted for her holiness. A number of legends attest to her religious faith. She was canonized by Pope John Paul II in Kraków on 8 June 1997. A brief biography in Europe, 1450-1789: Encyclopedia of the Early Modern World, can be accessed by clicking here. There is also a brief entry on Jadwiga of Poland in the online Encyclopedia Britannica (click here). I recommend the entry on Jadwiga in Helen J. Nicholson's The Crusades--you should be able to access it via Google Books. It is particularly good for its account, though brief, of the Jadwiga-William-Jogailo marriage question. And, then, there is Charlotte Kellogg's 1931 biography, Jadwiga: Poland's Great Queen; it is out of print, but used copies do pop up on Amazon occasionally. *Louis involved himself in Neopolitan power struggles after his brother, Andrew of Hungary was assassinated, and Andrew’s wife, Queen Joanna I of Naples, was held by some to be responsible for her husband's murder. Despite all of Louis' claims and meddling, he could never acquire the kingdom of Naples, and Queen Joanna's successor, Charles of Durazzo, in his turn claimed the crown of Hungary. **In designating her as rex, the intention seems to have been to emphasize that Jadwiga was a queen regent, and that whomever she married would be her consort, not her replacement. Although the date of her birth is not recorded, Mary Craddock was baptized on 26 March 1633 by her father, the Reverend John Craddock, in the rectory of St. Paul's Church, Barrow, Suffolk. Her mother's first name was Dorothy, but her family name is obscured on her marriage record. Mary’s father may have begun his daughter's training as an artist himself, for the Puritan clergyman was known to have been an amateur painter. He was also a member of the Painter-Stainers Company of London, presenting one of his own paintings ("of varieties of fruits") to them in 1648. Speculation about other artists who may have contributed to Mary Craddock's training include the portrait painter Robert Walker, who painted the Reverend Craddock's portrait in the late 1640s, as well as the court painter Peter Lely and the miniature painter Matthew Snelling, both of whom lived and worked in nearby Bury St. Edmonds, and who were members of John Craddock's social group. Mary Craddock met and married Charles Beale, a cloth merchant, in 1652, when she was eighteen. Like her father, Beale was an amateur painter. Mary Craddock Beale relocated with her husband to London, settling in Covent Garden. Over the course of the next few years, she gave birth to and buried a son, then gave birth to two more boys. During these early years she must have continued painting, because by 1658, she is well enough known that she is named in Sir William Sanderson's Graphice, Or the Most Excellent Art of Painting, where she is noted as one of four (married) women painters active in London. In 1665, the couple relocated to Hampshire in order to escape the plague in London, but they returned to London, this time taking up residence on Fleet Street. At about the same time, Charles Beale lost his job as clerk in the Patent Office, and Mary Beale transitioned from painting as an amateur to painting as a professional. Charles Beale took over the management of his wife's studio, "organizing commissions," recording payments received and debts paid, and "preparing colors." His detailed notebooks, a few of which survive, contain records of Mary Beale's work, her associations with other artists, and the "business" of art, including the close care needed with her subjects, who needed to be chosen in order to protect her reputation. Through her work as a painter, Mary Craddock Beale was able to support her family--in 1677 alone, she had eighty-three commissions (all carefully recorded by her husband in his notebooks). But by 1681, when fashions had changed, her popularity waned, and Beale once again made an adjustment, taking on students, including Sarah Curtis Hoadly. Beale died in London on 8 October 1699, aged sixty-six, and is buried at St. James's Church, Piccadilly. In her work, Mary Craddock Beale focused on portrait painting, working in oil, water color, and pastel, her style sometimes described as "vigorous" and "masculine," a word often used to praise women painters. Her work was also praised for its "color, strength, force" and "life." In addition to her painting and teaching, Beale wrote, including instructional materials, a piece titled Observations, in which she explained how to paint apricots. A large body of work survives, as a quick Google search will show. I recommend the gallery at Artnet for a good survey--it currently includes 169 of her works. I also recommend Ruth Dugdale's charming essay, "On the Trail of Suffolk Artist Mary Beale," published in the East Anglian Daily Times. There is also a chapter on Beale in Ellen Creaythorne Clayton's 1876 English Female Artists, accessible at the Internet Archive (click here). Rosalba Carriera, the "Most Famous Pastellist"
Born in Venice, Rosalba Carriera was the daughter of Andrea Carriera, a government clerk, and his wife, Alba Foresti, a lacemaker. Carriera is thought to have begun her career making lace-patterns for her mother. It may have been the decline in the lace trade that led to her change of medium: Carriera began painting miniature portraits on snuff boxes. The self-taught Carriera was also an innovator, using ivory as the ground for her miniatures. In 1705, at the age of twenty-five, she earned recognition from (and a special membership in) the Accademia di San Luca in Rome. 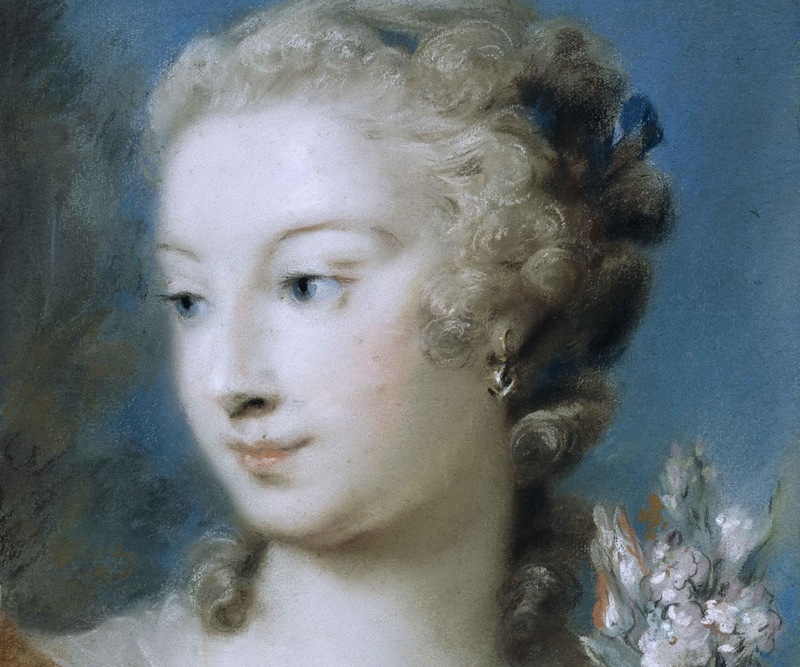 She had also begun experimenting with using pastels for portraits, her earliest pastel dated to 1700. The medium had been used for informal studies or preparatory sketches, but Carriera is credited with the use of pastel for "serious portraiture." 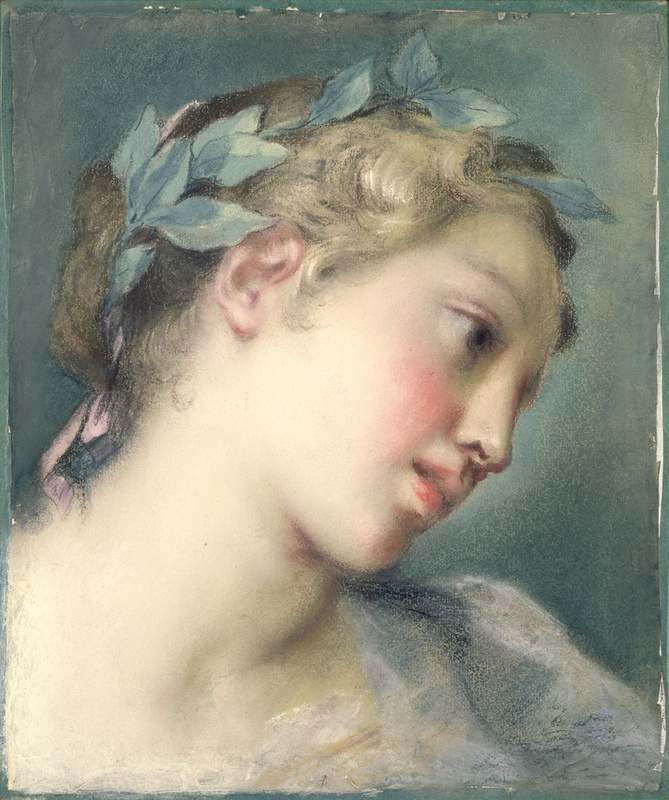 While many women artists contribute to the development of the medium of pastel, Germaine Greer notes, in The Obstacle Race, that "the exploration of the possibilities of pastel portraiture was advanced most" by Carrera's work. After 1708, art historian Neil Jeffares writes, Carriera "devoted herself particularly to pastel." Of the 440 surviving works now credited to her, "three-quarters are in pastel." Also visiting her studio was a notable collector, the French banker Pierre Crozat. In 1720, at his suggestion, Carriera traveled to Paris, where she spent "a triumphant year," receiving commissions for some fifty portraits, including one of Louis XV. She was elected to the French Académie Royale de Peinture et de Sculpture in that year, as well as to the Accademia Clementina in Bologna. After leaving Paris, Carriera returned to Venice, but in 1723 she left for Modena, where she spent five months at the Este court. Back in Venice, one of her great patrons was the British consul, Joseph Smith--later, the work he commissioned from Carriera was acquired by King George III. In 1730, Carriera again left Venice, this time for the court of Vienna, where she spent six months and fulfilled a number of commissions for Holy Roman Emperor Charles VI, whose empress, Elisabeth Christine, became her pupil. But by 1737, her output began slowing--her sister Giovanna, who had traveled and worked with her, died, and her own eyesight began to fail. By 1745, Rosalba Carriera was blind. She lived in Venice, in Dosoduro, where she died in 1757, at the age of eighty-four. In describing Carriera's style, Jeffares notes her "distinctive vaporous style" and her "delicate and light palette." She was, above all, a "consummate artist." Jeffares's comprehensive essay on Carriera, in the Dictionary of Pastellists before 1800, is readily accessible online (click here). There is an excellent entry by Margherita Giacometti in the Dictionary of Women Artists. A catalogue raisonné of her work was published in 2007, in Italian, with black-and-white illustrations--used copies are occasionally available. But for once I might suggest you look at the Wikipedia entry for Carriera, which has a wonderful, expansive gallery of her work. You can search online and see her work in various collections--the National Gallery (London) the Victoria and Albert, the National Museum of Women in the Arts, the Getty, and the Uffizi, for example. Virtually nothing is known about the early life of Anna Maria Lane, not even her name before she was married. 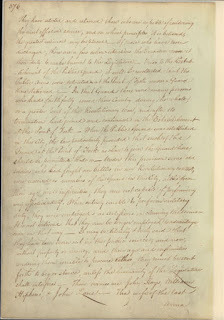 In For Virginia and For Independence: Twenty-Eight Revolutionary War Heroes from the Old Dominion, historian Harry M. Ward indicates that she was probably born about the year 1737 somewhere in New England, perhaps New Hampshire or Connecticut. At some point before 1776, she married John Lane, who seems to have been born about 1727. His place of birth is also unknown, but in 1776, John Lane enlisted in the Continental Army in Connecticut, serving under General Israel Putnam. 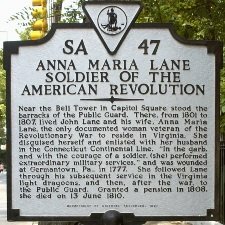 For all that is unknown about Anna Maria Lane, one thing is certain: she is the only Virginia woman documented for her role as a soldier in the Revolutionary War. The Lanes seem to have been middle-aged in 1776. They also had a daughter, a young girl named Sarah. Anna Maria Lane may have followed her husband when he joined the Continental Army, but at some point, either by necessity, deception, or with permission, she dressed herself in men's clothing. No longer a camp follower, she began to live and fight as a "common soldier." Together with her husband, she was at the battles of White Plains, Trenton, Princeton, Germantown, and Savannah. Indeed, it is because she was severely wounded at the battle of Germantown on 4 October 1777 that we know about her military service. During the battle she suffered a wound to her leg, perhaps a fractured femur or hip. The injury was severe enough that it would leave her permanently disabled. The wounded Anna Maria Lane may have been left behind at a makeshift military hospital in the Boehm German Reformed Church when Washington retreated--but she may also have resisted, since she would have risked discovery if she were subjected to medical examination. She may or may not have continued on with her husband--accounts vary as to whether she was with him in Savannah, where he was wounded and captured as a prisoner of war in 1779. By 1782, John Lane had been released and transferred from the Continental Army to the Virginia militia. In 1783, after the militia was disbanded, John Lane was appointed a state guard of Virginia, and then transferred from Richmond to Point of Fork, near Charlottesville. Anna Maria Lane was with him there, and both she and their daughter Sarah were hired in various capacities, including working as laundresses. In 1801, John Lane was transferred back to Virginia. Then seventy-five years old or so, he was one of the sixty-eight old soldiers who made up the "guard garrison" and performed light duties. For her part, Anna Maria Lane went to work as a nurse in the military hospital in Virginia. In recognition of the work she performed there, Dr. John H. Foushee, Virginia's health officer, petitioned then-governor James Monroe on her behalf, and she was paid a small stipend. By 1804, Anna Maria Lane was so incapacitated by her old injury that she was dismissed, no longer capable of working. In 1808, John Lane and several other old soldiers were also dismissed from the guard garrison. In awarding a military pension to Anna Maria Lane, the Virginia Assembly noted that she was "very infirm, having been disabled by a severe wound, which she received while fighting as a common soldier . . . from which she never recovered." 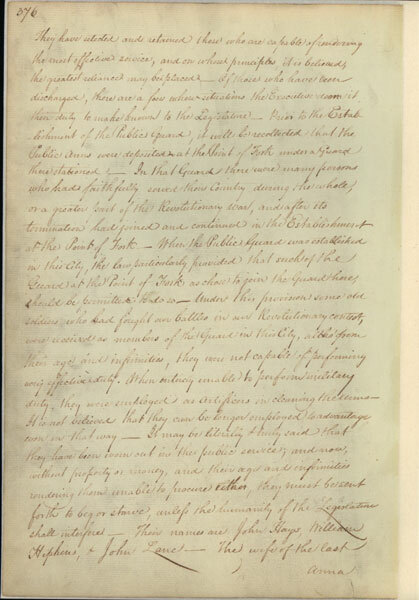 And, further: "In the Revolutionary War, in the garb, and with the courage of a soldier, [she] performed extraordinary military services at the Battle of Germantown." Anna Maria Lane died on 13 June 1810. In addition to Ward's history, noted above, I recommend the interview with historian Joyce Hunter posted on the Colonial Williamsburg website--to access it, click here. *Three other women received pensions at this time, but all three had been nurses during the Revolutionary War, not soldiers.